With the combination of high rates of affordability and rapidly rising rents, parents with kids just starting out in college may want to consider purchasing a property for the remainder of their 4-year stay rather than paying rent. Zillow data shows that the demand for off-campus rental housing is rising, creating a large spike in rental prices that show no sign of slowing down. On the other hand, home values are still below their peak levels and mortgage rates remain low, making for great bargains for buyers who plan to own their home for at least three years. 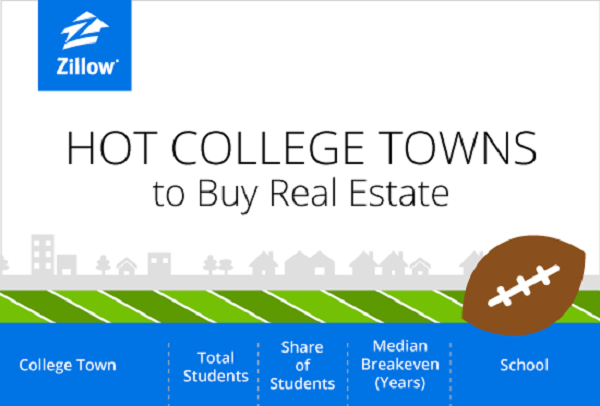 In order to help determine which college towns are prime for home buying we looked at each town’s breakeven horizon — the amount of time it takes for buying a home to become more financially advantageous than renting the same home — and selected towns where buying becomes more advantageous than renting after just three years or less, assuming many students live on campus their first year, then seek off-campus housing for the remaining three years of college. Some of the hot college towns we identified include Muncie, IN (Ball State University), where buying a home beats renting after only 1.3 years. Another city on the list, College Station, TX (Texas A&M University), has seen a significant demand for housing as nearly half of the population is enrolled in school. A similar trend can be seen in pricier cities such as Berkeley, CA (University of California, Berkeley), where rents have risen 20 percent from last year, outpacing the 4 percent home value growth seen over the same period. In Berkeley you can breakeven on your home purchase in just under 2 years.